This is a comprehensive, highly illustrated guide to military, law enforcement and antique firearms throughout history. It includes a history of firearms from the medieval hand cannon to today's FN Minimi light machine gun. It contains directories of arms from around the world, organized by country of manufacture, and features key specifications for each weapon, including calibre, magazine capacity, barrel length and unloaded weight. With 1100 colour photographs and artworks, including cutaway diagrams to show internal components and gun operation, this comprehensive encyclopedia is both an expert reference work and stunning visual directory, explaining the development of arms, and showing the individual specifications of modern weapons. The history of arms begins with 14th-century hand cannons and outlines technological advances, such as the percussion principle and the beginnings of the modern cartridge system, as well as the rise of mass production and the craft of the gunmaker. Modern arms are then explained, covering the materials and technology including Super Magnum revolvers, semi-automatic pistols and assault rifles. 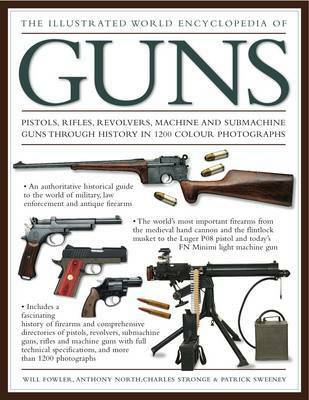 The directories offer an unparalleled photographic guide to the most significant pistols, revolvers, rifles, submachine and machine guns. Grouped according to country of origin, each gun's features are listed, as are the military, political and technological context in which each gun was developed.